Fleurieu Link is a multi-media publication and includes this website with all advertisers listed and cross-referenced against the services and products they provide. 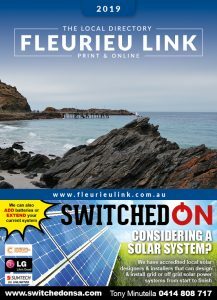 And Fleurieu Link is also a locally printed and distributed book with over 26,500 copies printed and distributed annually to homes and businesses throughout the Fleurieu Peninsula. The printed guide is packed full of features including: The Fleurieu’s most comprehensive local business directory located within our Gold Pages section, a listing of local residential and business phone numbers in the general listings section – in larger print than the Sensis directory and other features including local maps and emergency services and local health providers contact information. Fleurieu Link is not a part of Sensis White Pages or Yellow Pages or any other local or national directory company.